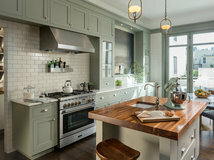 If you’re looking for a refreshing color to revitalize your kitchen, look no further than green. Its association with fresh fruits and vegetables makes it a natural choice to introduce a cheerful vibe. And there are many variations of green that work well. 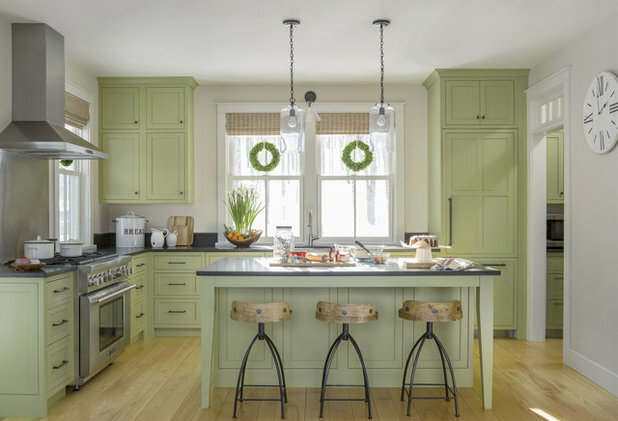 Here, four kitchens show how various shades of green on the cabinetry can deliver wonderful results. Homeowners’ request. Maximize storage while keeping everything open to the adjacent dining room. 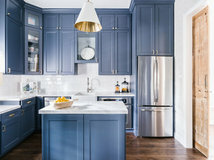 Cabinet color. 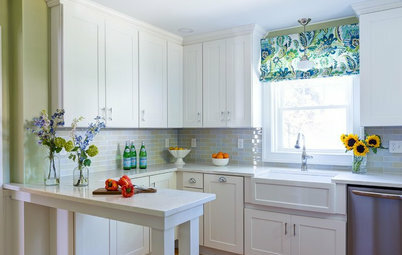 Brookside Moss, in satin finish, by Benjamin Moore on all cabinets. Other special features. Inset Shaker-style cabinet doors. Ash floors. Honed Absolute Black granite countertops. Large windows. Nine-foot ceiling. “Uh-oh” moment. “The pantry beside the kitchen was hard to access, so we removed the door and integrated cabinets to make it feel more like the kitchen,” builder Chris Ambrose says. Homeowners’ request. 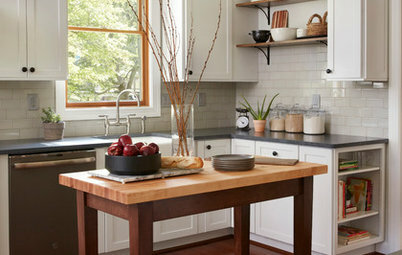 Open the kitchen, increase space, add timeless style and save money by repainting the existing cabinets. Other special features. Limestone tile backsplash. Oil-rubbed-bronze fixtures. White oak-wrapped island beam. Single-slab quartz countertop on the island. 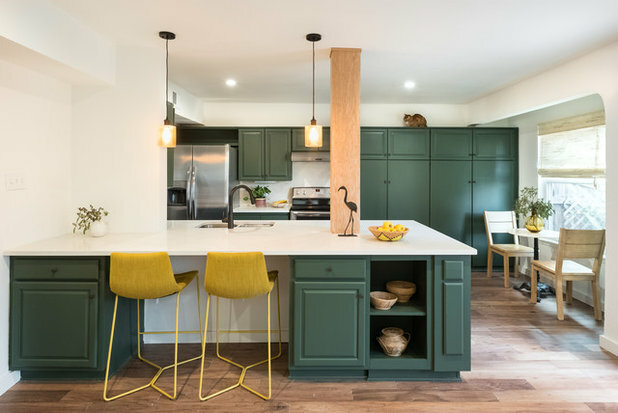 “I wanted a pop of color that would blend with the green, so I selected mustard yellow counter stools,” Boschenko says. Designer tip. 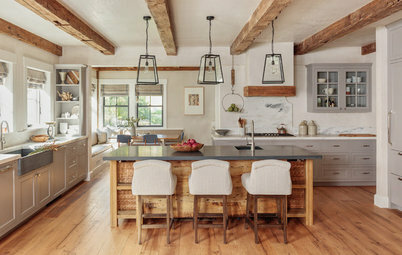 “Incorporate neutrals and natural elements to add depth, texture and character without being overwhelming or busy,” Boschenko says. Homeowners’ request. 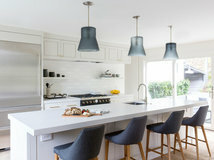 Combine an existing dining room and poorly laid-out kitchen to create a comfortable circulation while updating finishes and relocating laundry machines out of the kitchen. 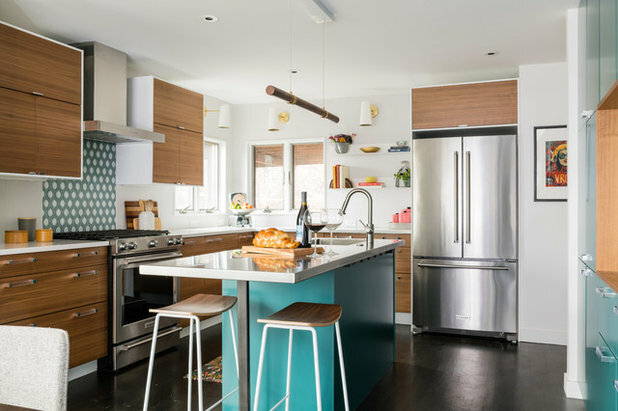 “A stainless steel island counter with integrated sink was a must, but the space also had to feel warm and inviting,” designer Resa Gray says. 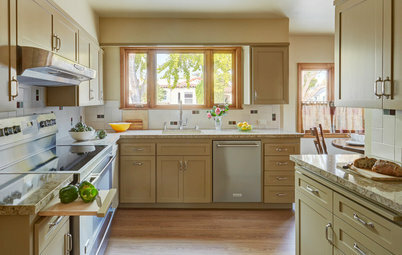 Cabinet color. 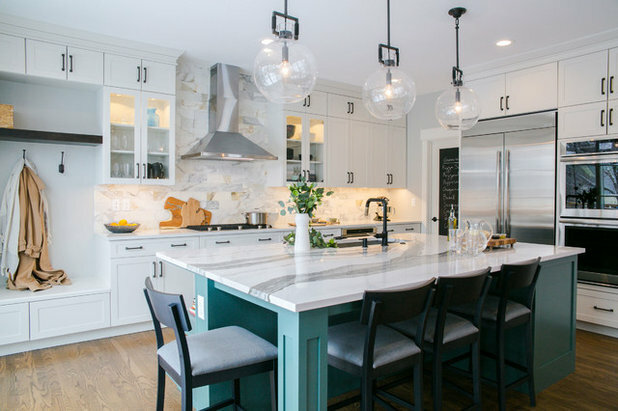 Dark Teal by Benjamin Moore on the island and the wall of cabinets (seen in the next photo). Other special features. Warm walnut wood. Textured tile walls. 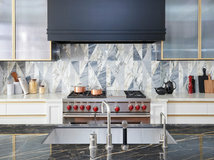 Geometric tile backsplash behind range. Sconce lighting. Mixed metals. 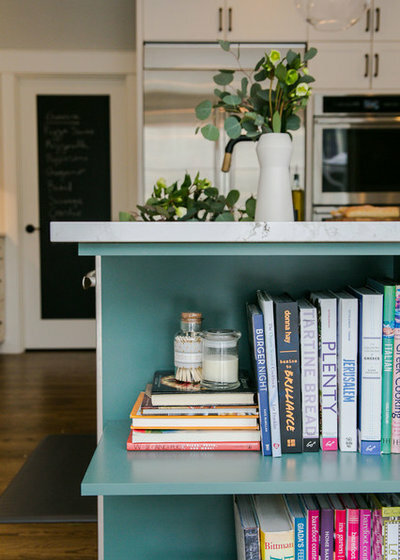 “The vibe is a blend of contemporary and midcentury modern with a touch of glam to create a fun, lively atmosphere for cooking and entertaining,” Gray says. Designer tip. 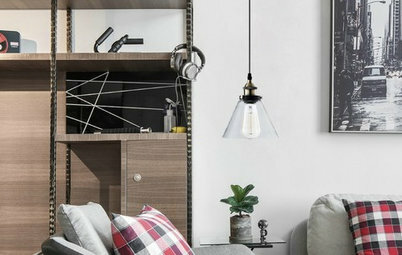 “I recommend having multiple light sources — recessed in ceiling, wall sconces, pendants and undercabinet — all on dimmers so the lighting scenes can be customized as desired,” Gray says. Homeowners’ request. Add a 12-foot sliding door to the backyard, reorient the island for better flow and give the space a bright, clean style without making it too sterile. Other special features. Firenze Calacatta marble tile backsplash. 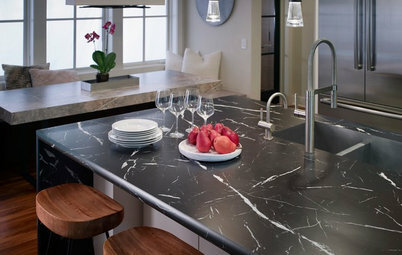 Quartz countertops. Matte-black-and-gold-finish faucet. Large globe pendants. 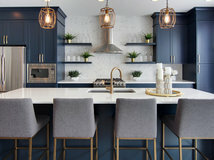 “Adding in the dark metal accents of the hardware, light fixtures and faucets gives us moments of interest without distracting from the beauty of the island,” Christensen says. 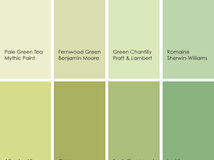 I like green but I've lived with it in the past and found I tired of it quite quickly. 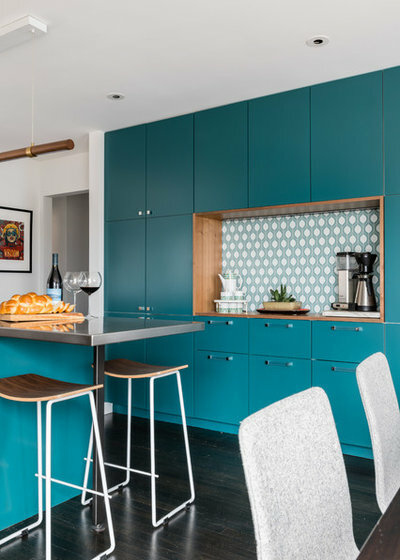 My sister had a dark teal kitchen in the 80s, and though it made a statement, it was also a bit oppressive with everything that color. 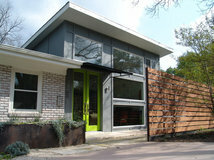 Just a wall, like in the example shown, is a treat. 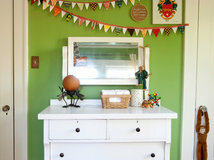 I painted and glazed my kitchen island green, leaving the surrounding cabinets stained. 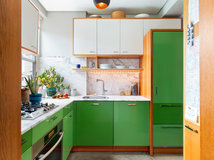 It changed up the kitchen without committing to full-on green cupboards. The cat lover in me is slayed by the kitty in #2! I like neutral kitchens best, in terms of paint and cabinetry. I’ve seen a few pretty ones in other colors, but something like green or blue seems as though it’d look dated quick - and it would be tough to match furniture and wall art. I stayed in an Airbnb in Germany a couple summers ago, the kitchen was neutral — except for the purple fridge! It looked like a 50s-style item, in a good way. 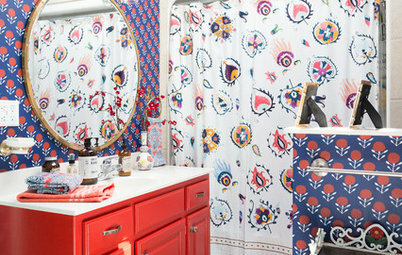 An entire kitchen in purple would be overwhelming, but the statement piece worked awesome.